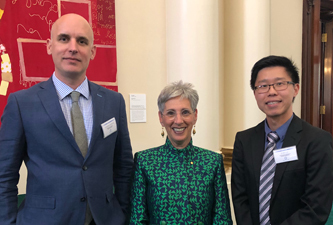 At Government House last night, SVI's Dr Andrew Sutherland and Dr Kim Loh were awarded grants by the Diabetes Australia Research Program (DARP) to further their research into finding new ways to tackle type 1 and type 2 diabetes. Recent research undertaken by Dr Sutherland shows that a molecule called IL-17F may play a role in the development of type 1 diabetes. He will use the funding to further investigate the potential of IL-17F as a target for immunotherapy in type 1 diabetes. Dr Loh will be using his DARP Award to explore the potential therapeutic possibility of targeting a newly identified pathway to improve beta cell function in type 2 diabetes. Despite the similarities in their names, type 1 and type 2 diabetes are different diseases, with diverse origins. What they have in common is that they are both chronic conditions that affect the way the body regulates blood glucose levels and they both seriously impact the lives of those who are affected, and their families. Glucose provides the energy that fuels the body’s cells. In order for glucose to be accessible to the cell, it requires the hormone insulin. People with type 1 diabetes have lost the ability to produce insulin because the body’s immune system attacks the cells in the pancreas, called beta cells, that produce it. People with type 2 diabetes don’t respond to insulin as they should and some don’t make enough insulin. On World Diabetes Day, SVI is proud to be spearheading research into both type 1 and type 2 diabetes. For more information about diabetes in general, and our diabetes research, read the latest issue of our newsletter, entitled ‘Unlocking diabetes’, or view our infographics pages on type 1 diabetes and type 2 diabetes.